Sometime in the last few years I realized you could use greens other than basil for pesto. It was a revelation. Arugula, sorrel, or any stronger-flavored leafy green works beautifully. Nettles, which we talked about in the last post, are no exception. 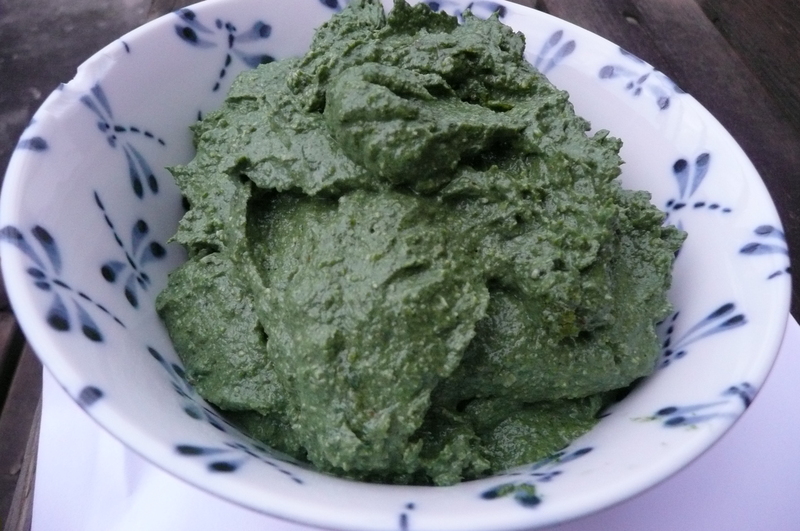 The pesto has a rich, earthy flavor and is dark green. The only difference in preparation is that whereas other greens I’d use fresh, I cooked the stingers out of the nettles first out of fear I’d accidentally make the Sadistic Nettle Pesto of Horror. Just as I first posted this, though, someone commented on the last post that food processing them also destroys the stingers. I’d have to test it to be sure myself, but I liked the rich flavor of the cooked version so much I think I’d keep doing it this way. As I mentioned last time, you can disable the stingers by cooking the nettles for a minute or so in boiling water. But you don’t want your pesto to be watery, so drain the final product well and squeeze it out. I ended up cooking my nettles on a different day than I made pesto, and the added time sitting in the fridge also helped decrease the moisture. Nettles weren’t the only inspiration for making this. Pesto’s been on my mind since a few weeks ago when I realized the Sidhu Farm stand at the Ballad Farmers’ market was selling unshelled walnuts. I had two dollars left on me, and got a nice little bagful for that. A stop at Goodwill yielded a nutcracker and the recent nettle harvesting settled which greens I’d use. The fate of nettle pesto was sealed. 1. In a food processor, blend the walnuts, the garlic, and half the olive oil. 2. Add the nettles, the rest of the olive oil and the salt. Run the food processor until the mixture is smooth. 3. Add the parmesan and pulse a few times to combine, or run until smooth, depending what texture you prefer. 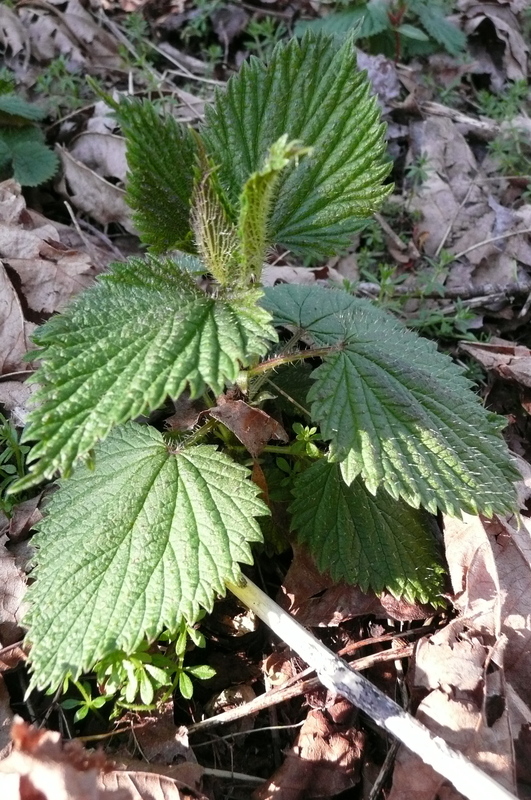 The nettles are up! In addition to dandelion greens, I’ve been harvesting nettles and making delicious things out of them. Nettle, or stinging nettle, is a general term for the genus Urtica, an invasive species with painful little stingers and medicinal properties. You may have learned what nettles are the hard way, brushing against them and wondering why you suddenly developed painful little welts. Just the kind of plant you want to eat, right? Well, the stinging goes away when they’re cooked, and then they become a wonderful, deeply-flavored green that’s absolutely worth harvesting. To harvest nettles: bring a thick bag, a thick pair of gloves (some people seem to have the magic ability to resist nettle stings; I’m not one! ), and a pair of scissors. Make sure you’re somewhere where pesticides aren’t being sprayed, and be aware that you’re technically not supposed to harvest at city parks. Harvest nettles when they’re young, about 4-8″ tall and not yet flowering. Cut the young stalk and collect in your thick bag. I feel it’s obvious to say, but NEVER to eat nettles without cooking them first. These things hurt to touch fresh; you don’t want that in your mouth and throat. Luckily, tossing them into boiling water completely erases the problem. To cook your nettles, do the following: Boil a pot of water. 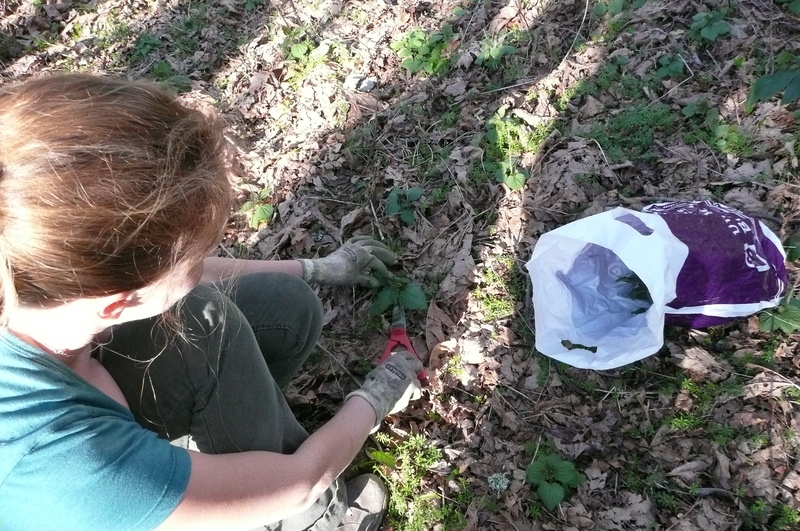 Wearing thick gloves, pick out any non-nettle bits among the nettles. Wash them in a colander. Dump the nettles straight from the colander into the boiling water and cook for a minute or two until the nettles go limp. This destroys the stingers. 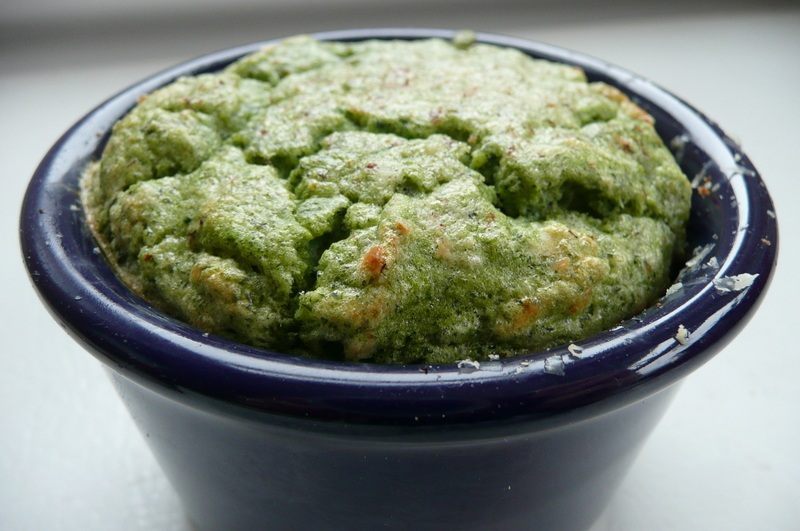 Here’s a quick recipe for a nice, mild savory souffle of nettles and ricotta made in small ramekins. You can use other wild greens too, but the nettles are especially nice. 1. Butter four ramekins and set aside. Preheat oven to 375F. 2. Separate eggs, keeping whites in a bowl and placing yolks in a food processor. 3. 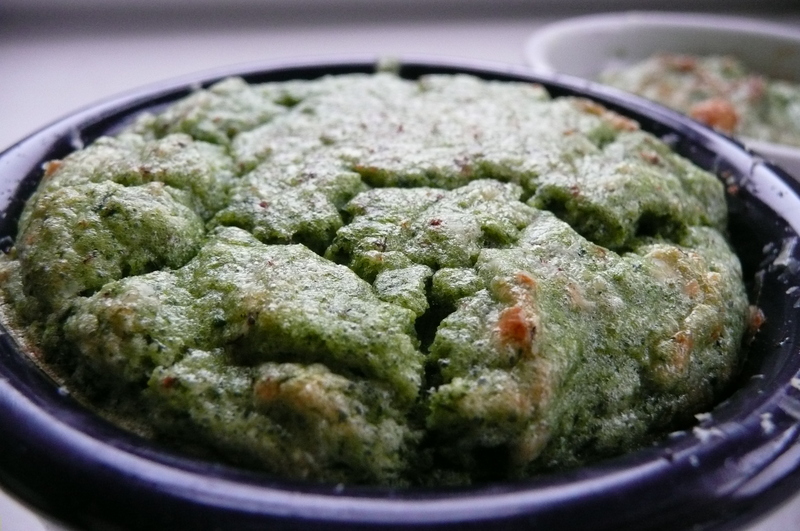 To the food processor with egg yolks, add nettles, cream, ricotta, rice flour, salt, and a few grates of fresh nutmeg. Close and process until combined and the nettle is finely chopped. 4. Beat the egg whites until stiff. Using a rubber spatula, gently fold in the nettle mixture. 5. Divide batter into four buttered ramekins. On the top, grate a little parmesan cheese and a little more nutmeg. Bake for about half an hour or until golden brown on top, and serve. Goes well with soup or salad. I haven’t been following the Olympics. Not out of any lack of love for winter sports; I think they’re gorgeous, but I don’t have a TV and have been pretty busy writing a thesis and keeping up with grad school. 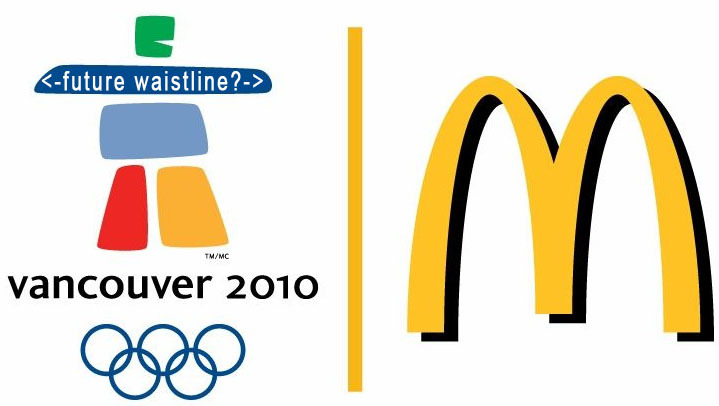 So I was surprised today when my cousin mentioned over lunch that McDonalds was a sponsor. We were both pretty taken with the irony. Eating fast food isn’t going to give anyone the kind of physical health they’ll need to be an Olympic athlete, and would impair such a goal. 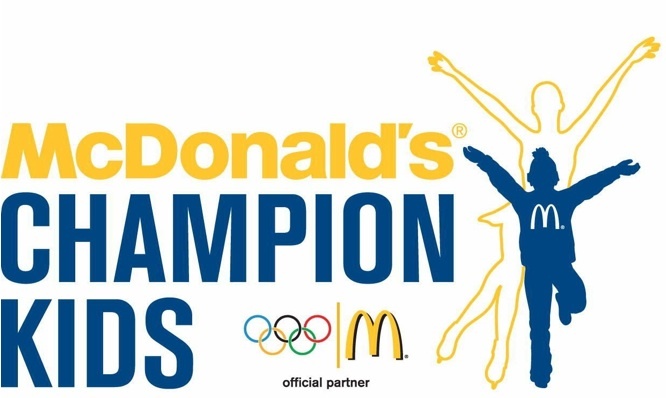 We’ve gotten to a point where tobacco companies can be sued for marketing to kids, but McDonalds can imply their food will help kids grow up to be Olympic athletes. Where cheap fast food comes with cheap toys, and where fast food is one of few affordable options for people with minimal income, who then lack health insurance to deal with its consequences. This problem feels too institutionalized and large. I derive some hope from the history of changes in tobacco legislation, but only so much. The regulations on fast food often focus on the wrong things (e.g. salt and saturated fat rather than sugar and polyunsaturated omega-6 atty acids). Also, despite tobacco regulations, kids still start smoking every year, and tobacco companies still use insidious marketing, especially outside the U.S.
Any thoughts on this? Is it harmless? Insidious? Is the irony transparent and, if so, to whom? And how are the curling competitions going? Enjoy watching for me too. 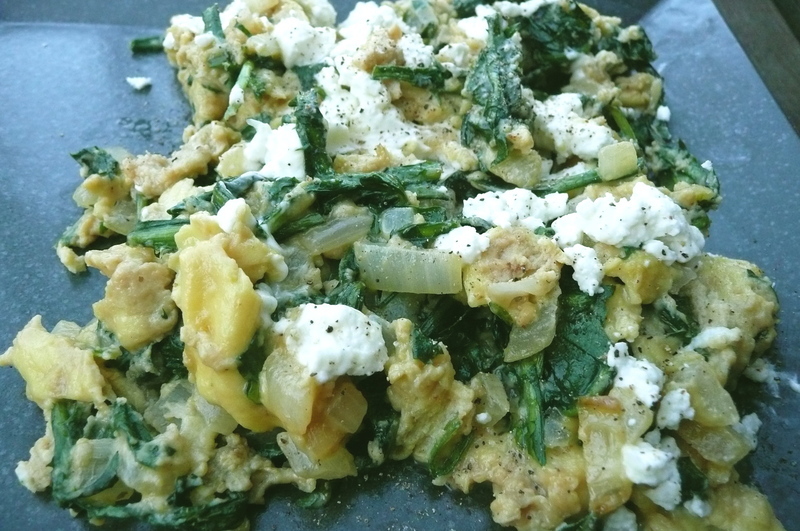 Dandelion green, onion & goat cheese scramble. Eat your yard for brunch? Along with the early spring, we’re getting lots of greens popping up ahead of schedule. I’m posting a simple recipe for dandelion greens today because I know a lot of people who are aware the greens are edible, but unsure how to use them or when to pick them, or simply never get around to doing it. 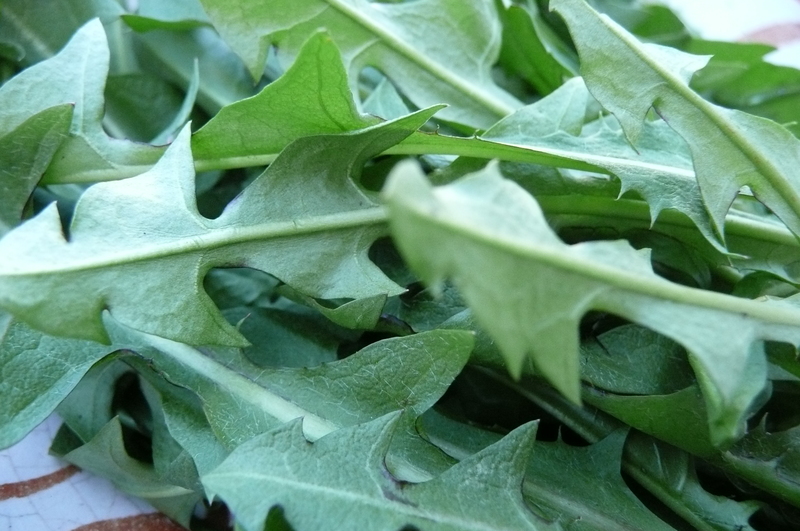 Considering how abundant and invasive they are this time of year, and that they’re free, dandelion greens are a great wild edible to have on your what’s-for-dinner radar. And what better way to start a sunny Sunday than picking some out of the yard and enjoying a relaxed brunch? Dandelion greens are delicious. Their flavor is vaguely like a cross between arugula and spinach with a hint of bitterness (they get much more bitter once the flowers come up). You can use them in salads, sauté them, use them anywhere you would a thin-leafed green. It’s a great time of year to pick dandelion greens, while they’re still young with small leaves. Pick them when they’ve just come up as rosettes, no flower stalk has formed, and the leaves are thin and delicate. Pick them from places where soil contamination is less likely or where they’re not being sprayed with pesticides. My favorite use for them is in a simple scramble. I add onions I’ve chopped finely and allowed to absorb cream, and I sprinkle goat cheese on top. In late spring/early summer, fresh peas would also be a great addition. Dandelion green, onion and goat cheese scramble. 1. Pick dandelion greens. Clean carefully in cold salt water, picking out any grass or non-dandelion bits. Drain and dry well. 3. Add 2 tablespoons of the cream to the onion and let the onion absorb the cream, stirring occasionally. The onions will get plump and delicious. 4. Add dandelion greens finely chopped and stir until wilted. Add another dab of butter. 5. Beat together the eggs and remaining cream, and pour into pan. On low heat, scrape the eggs inward from the sides of the pan until eggs are just barely cooked. 6. Move eggs to plate and crumble fresh goat cheese on top. Grate on some black pepper and serve. Sometime in February I usually start thinking about the fruit I put into my freezer last summer, and how I’d better start using it because fresh fruit will start appearing in the markets in just four months. February is just long enough from last summer, of course, that the fruit tastes extra good. I was still picking huckleberries in October; December feels a little too early to enjoy them properly. February, a month of chicken soup and hearty stews and winter greens, feels just right. Last year, I bought a chest freezer used on craigslist, and it’s been really handy. I can stock up on meat when it’s inexpensive, put large bags of rice into it to hide them from kitchen moths, and freeze summer fruit at its ripest and cheapest. When half flats of local raspberries and blueberries went on sale for $5-$7, when farmers were trying to get rid of over-ripe peaches, and when I went huckleberry picking, I saved the fruits for February. Happily, I discovered I had quite a bit more huckleberries than I’d remembered in my freezer. I’ve been most fond of baking tarts with hazelnut meal crust (I’ll post the recipe at some point) but I wanted something simple, fast, and fairly healthful (e.g. no sugar, very little honey, very little grains with lots of good eggs and cream). 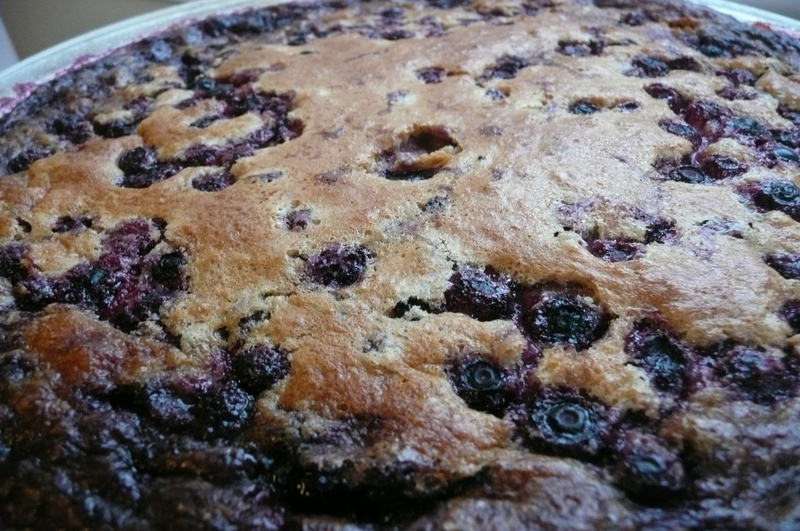 Clafoutis is a French dessert, a baked cross between custard and cake which is packed very densely with fruit. Cherries are traditional (we have a bag in the freezer destined for clafoutis tomorrow), but huckleberries are my favorite fruit, and this clafoutis shows them off well. You can use pretty much any summer berry or stone fruit. If your freezer isn’t stocked, Madison Market has local berries and peaches in its freezer case, Sidhu Farms (Ballard farmers’ market) sells frozen raspberries and blueberries, and Foraged & Found sells frozen huckleberries (talk to them a week in advance at either farmers’ market). This recipe uses an almond flour base, but you could do it with all rice flour or try other nut meals as well. My experience is that clafoutis is fairly forgiving. *NB: If using larger fruits like raspberries or even regular-sized blueberries, use closer to two cups of fruit. Huckleberries are small so a cup of berries means more fruit/less air than a cup of something larger. 2. 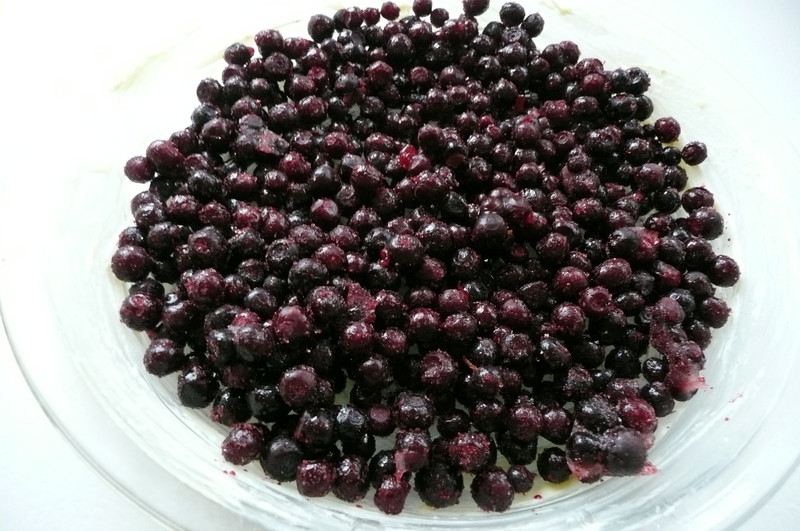 Butter a pie dish and place two thirds of your huckleberries (1 cup) into the dish. 3. 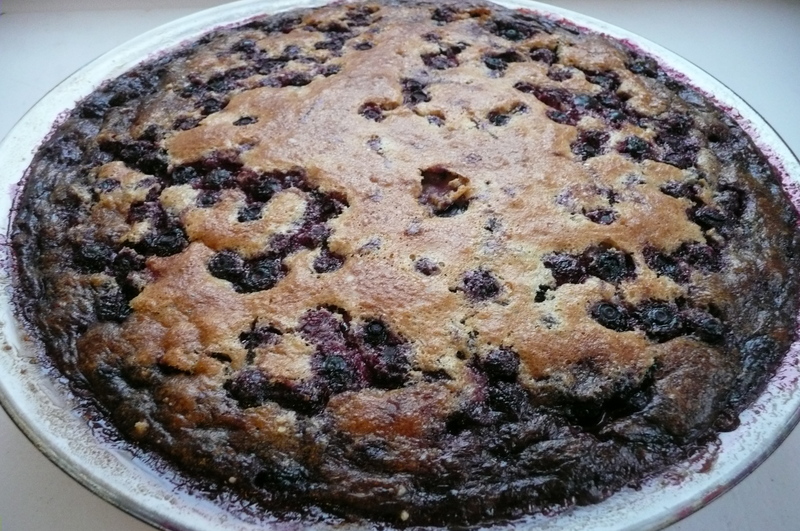 Pour the batter over those huckleberries. 5. Bake at 375F for 45 min – 1 hour, until top is golden-brown and a knife comes out clean. Serve warm if possible. 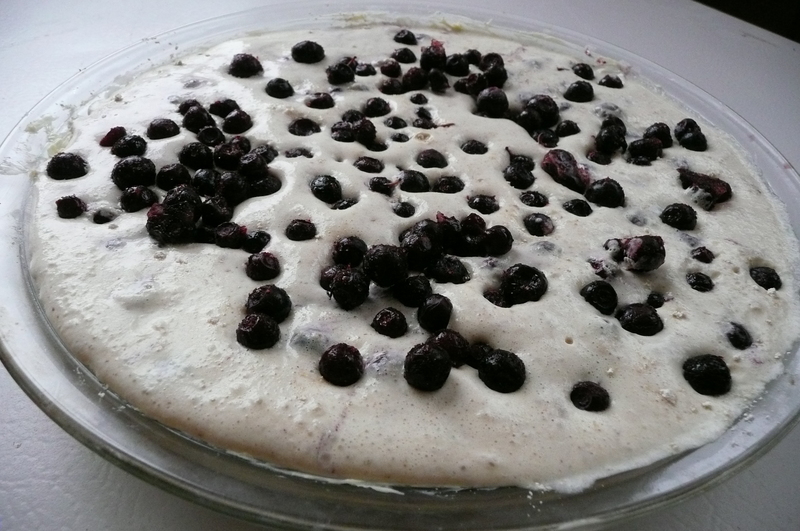 Delicious plain, or with whipped cream or coffee or vanilla ice cream. You know the old joke about Jewish holidays, how most of them follow the narrative, “They tried to kill us; they failed; let’s eat!” But I’m no longer sure which pillar of Jewish tradition this better describes: The holidays? Or…the deli? 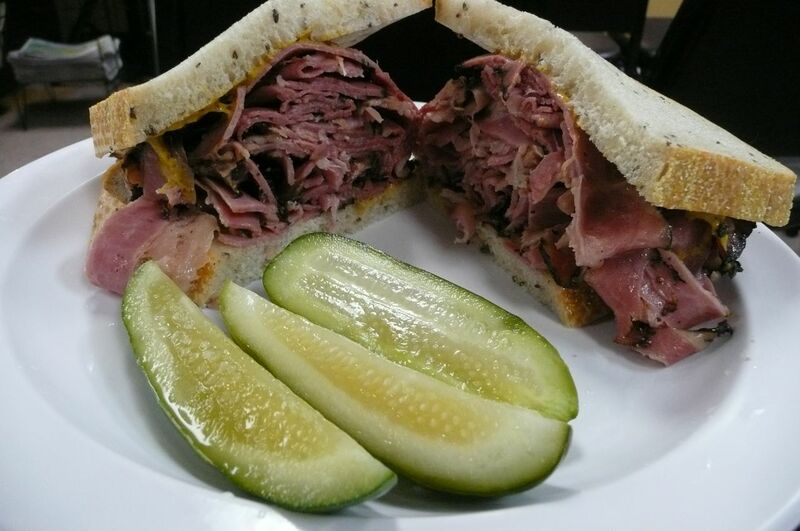 Call the comment tongue-in-cheek –– or pastrami-in-cheek, whatever your taste dictates –– but the rebirth of the Jewish deli is no chopped liver. And, in fact, taste is central to the deli’s revival, according to journalist and author David Sax. He sees Jewish delicatessens not as museums, but places that are preserving both Jewish flavor and culture. For more, check out the rest of the article here. Thanks to Jessica for sending this one in. Local forager Langdon Cook is speaking tomorrow at Wide World Books and Maps on how to improvise delicious recipes out of wild, foraged foods, particularly those of our region. Considering the early spring weather we’re having, you’ll be able to try out some of these ideas right away. 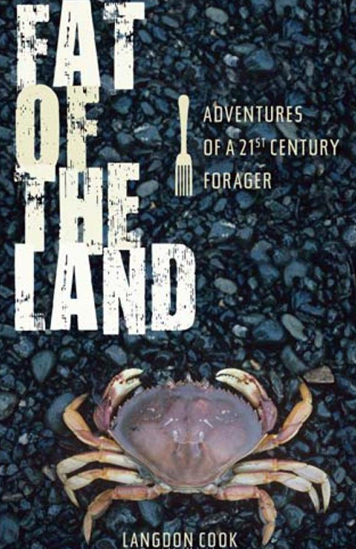 He’ll also be talking about his new book, Fat of the Land: Adventures of a 21st Century Forager. Cook writes a really interesting blog about his foraging adventures and all things foraging-related. Here is the Seattle Weekly’s blurb about the event. And speaking of foraging, nettles are up early this year. I saw some while out walking the other day but had no bag or scissors. Hope to make it out for another woods walk soon and risk stings to make something delicious.